Since it’s been a year since the wedding, it has also been a year since our honeymoon and I’m feeling nostalgic. In honor of our honeymooniversary, I’m going to reminisce about some of my favorite parts of our trip. 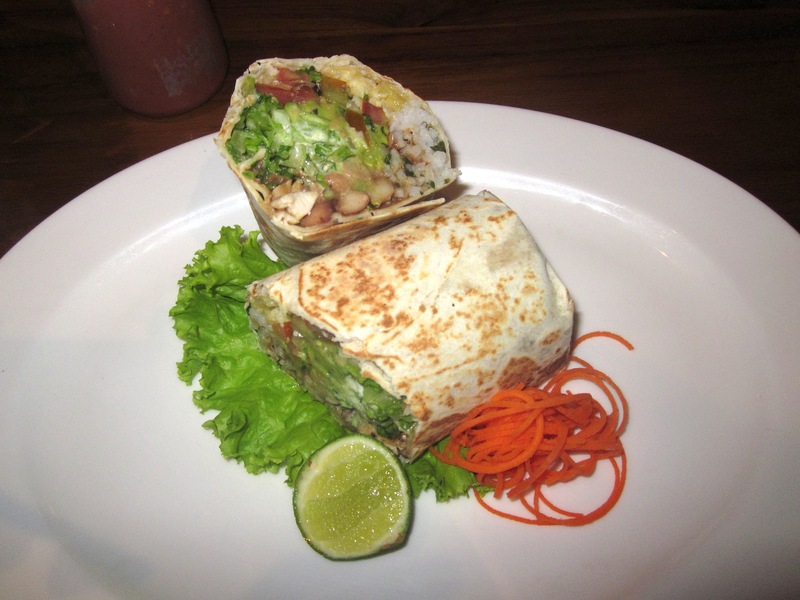 2) The burritos at Taco Casa in Ubud, Bali. Like most brides, I watched my diet and worked out a lot before my wedding. I didn’t do any juice cleanses or early morning bootcamp classes, but I did make myself give up burritos for a few months. Burritos are one of my favorite foods, you see, and I live close to some of the best taquerias in San Francisco, so this was no easy feat. But when we were on our way to our first hotel in Bali, I noticed a huge sign for burritos at Taco Casa. I didn’t care that we were in Indonesia which is probably one of the last countries in the world that I’d expect to produce good burritos, I was going to have one damn it. Despite having very low expectations, I thought my burrito was quite excellent. Maybe I’m just too burrito-deprived, I thought, but Aaron also thought his burrito was shockingly delicious. So coming from two San Franciscan burrito connoisseurs, we give Taco Casa two enthusiastic thumbs up. 3) The beautiful beaches in Hoi An, Vietnam – man, they were nice. 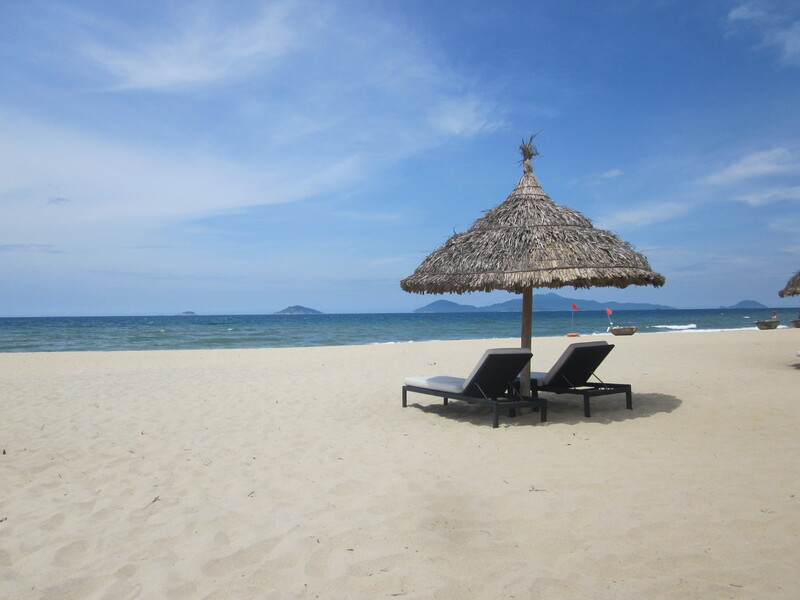 The photo above was taken on the private beach of our hotel – Boutique Hoi An Resort. We stayed for four nights and absolutely loved it, so I’d totally recommend it to anyone who’s thinking about going to Vietnam. The hotel was pretty busy because a German girl and Australian guy were having a destination wedding there. Since we were still totally in all-things-wedding mode, we chatted with the groom’s parents who told us that the couple met at a hostel while backpacking in London. (That’s the story that Aaron and I are going to use from now on whenever we get asked about how we first met.) It was fun to (respectfully) spy on their intimate beach wedding. 4) Our first successful bike tour together! I say “successful” because I didn’t cry at all. I’m not the best bike rider, and the last time Aaron and I went on a bike tour… let’s just say I didn’t have a great time. We were in Peru en route to Machu Picchu and our legs got eaten alive by sand flies, a guy in our group tried to take photos while biking and ended up breaking his face, I cried a lot during the unpaved portion of the trip, everything hurt, etc. So needless to say, Aaron was a bit worried when I suggested that we go on a bike tour around Hoi An. Even though parts of the trip were a bit rocky and I was constantly nervous about falling off my bike and landing in the shrimp farms, we made it and I’d definitely do it again. So how are we celebrating our first anniversary? With dim sum and a Rolling Stones concert. And if that makes us an old married couple, I’m totally okay with that. Can I just say that I heart this post. Almost as much as I heart you and Aaron. To old married couples!